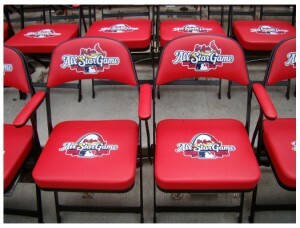 Athletic Seating’s Logo Chairs and Logo Stools are the same products MLB uses, so why not get them for your team! Don’t settle for cheaper knockoff chair, get the same chair thats the first choice for professional sports teams…MLB, NBA, college and high schools’ first choice for quality chairs made right here in the USA. And with Athletic Seating’s exclusive printing process, you’ll have the top of line team seating chair, with the finest logo printing you’ve ever seen. There IS a big difference in logo color printing, and we have the exclusive process to applying your teams logo to any of our seating products. Other chair dealers just take your order and pass it along. We take a great deal of pride and knowledge in screen printing your teams logo to the chairs and stools. Check out just a few of our testimonials and see for yourself.